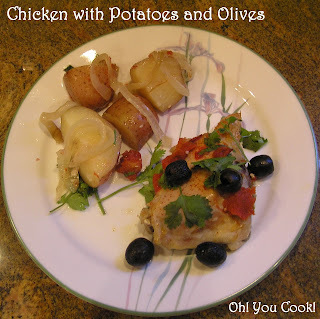 This recipe started out as my roast chicken with potatos and onions (Still no photos!). I jazzed it up with olives, diced tomatoes and a few aromatic spices to give it more of a Mediterranean flair. Similar recipes use green olives, but I used black olives, mostly because I didn't think to buy more than the one little jar of the green stuff for my meatloaf. The quantity of black olives in the ingredients list may seem a bit weird, but only the drained weight was listed on the can I used. If the brand of canned olives you use only lists total weight, I'd guesstimate my can size at about 14 ozs. Hope that's clear. On the other hand, we are not baking a cake here ... use the amount of olives you have at hand (in hand? In can?). Dinner will still be delicious. I promise.